Hamill Interacts with Star Wars Fans in Disguise! Watch Mark Hamill Interact with Fans Disguised as a Stormtrooper! Watch as Mark Hamill disguises himself as a stormtrooper and interacts with fans on Hollywood Blvd! 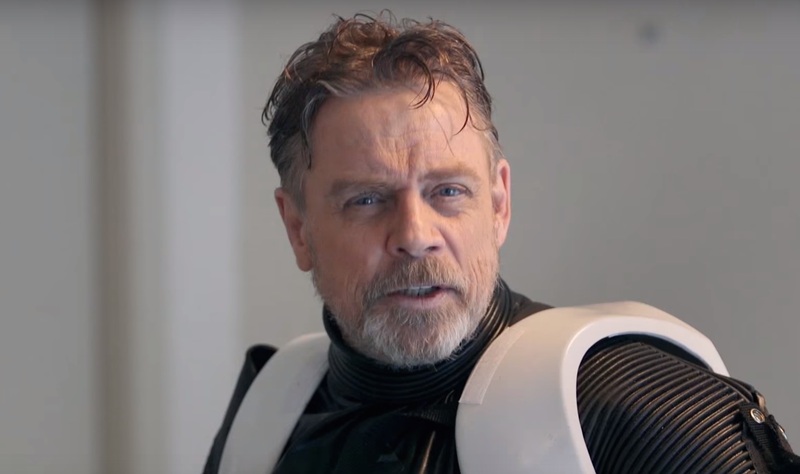 Because of Mark Hamill’s absence from all the Star Wars: The Force Awakens marketing, fans have been asking, “Where’s Luke Skywalker?” Today, a new video brings a possible answer: Perhaps he’s already standing next to you disguised as a Stormtrooper! Continuing The Force Awakens‘ charitable fundraising through Omaze, a new video has been released online that features Mark Hamill having quite a bit of fun of Hollywood Blvd. Disguising himself as First Order Stormtrooper (to blend in with the famous street’s many costumed characters), Mark Hamill explained to fans all about how they can, through the charity, win tickets to the December 14 premiere of Star Wars: The Force Awakens! Check out the video in the player below and find out how to donate and be entered to win right here. Directed by J.J. Abrams, the highly-anticipated movie stars Harrison Ford, Mark Hamill, Carrie Fisher, Adam Driver, Daisy Ridley, John Boyega, Oscar Isaac, Lupita Nyong’o, Andy Serkis, Domhnall Gleeson, Anthony Daniels, Peter Mayhew and Max Von Sydow. Kathleen Kennedy, J.J. Abrams and Bryan Burk are producing with Tommy Harper and Jason McGatlin serving as executive producers. The screenplay is by Lawrence Kasdan & J.J. Abrams and Michael Arndt. Star Wars: The Force Awakens will be followed on December 16, 2016 by Rogue One: A Star Wars Story, Star Wars: Episode VIII on May 26, 2017, and the Han Solo anthology movie on May 25, 2018. No release dates have been announced for Star Wars: Episode IX or for the third anthology movie. It was recently confirmed, however, that Jurassic World‘s Colin Trevorrow will be helming the third Saga chapter. Do you think you’d be able to recognize Mark Hamill’s voice if you met a mysterious Stormtrooper on the street? How would you react if you found out? Tell us in the comments below!